Nine months after enacting service fees to support parks and police in the City of Keizer, some of the major goals are close to becoming a reality. In the last month, a roof replacement at the Gazebo in Chalmer-Jones Park was completed as was a complete renovation of the play structure in north Keizer’s Meadows Park. In addition, four of the five police officers whose salaries are paid by the police fee graduated from the Department of Public Safety Standards and Training in early July. While the officers are done with the police academy, they will be riding alongside partners for the next few months before getting certified for solo patrols. The new officers are: Michael Kowash, Garrett VanCleave, Jeremy Darst, and Chad Fahey. 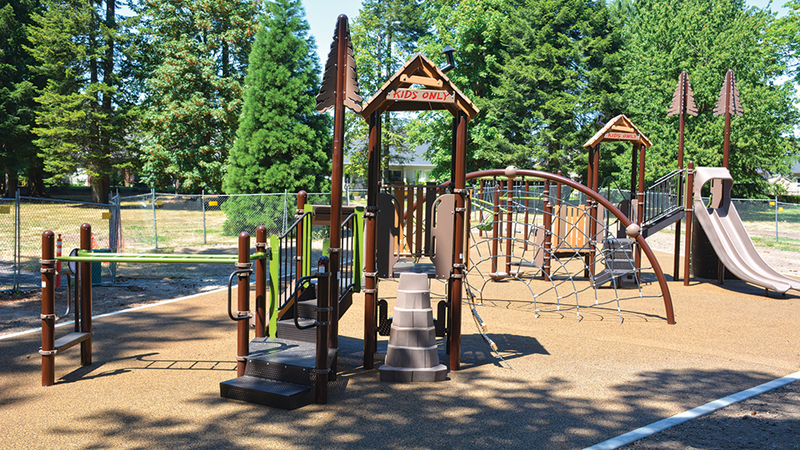 The replacement play structure at Meadows Parks includes separate structures for smaller children and older ones, one additional regular swing and a disability swing, and a climbing web for general use. All of it is on top of a rubberized fall-protection surface. The cost was $232,870 for the new playground. The new gazebo roof – the old one was reaching the end of its useful life – cost $7,700.